Windows Blinds is one of the well-known desktop transformation programs which can really do a lot of cool things with you Windows XP or Windows Vista desktop. For starters, it can do some serious work on customizing your Windows experience with the ability to change title bars, the windows look-and-feel and almost every visual part of Vista or XP by applying custom skins. Windows Blinds 6 comes with an additional free program called SkinStudio, which gives users the ability to create their own cool-looking or themed Windows skins with a few design ideas and clicks of the mouse. 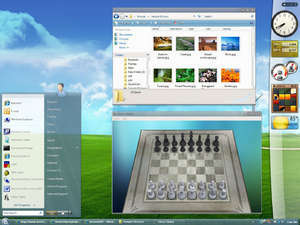 An additional feature that's been developed by StarDock is the 'blurred glass' look you see on Windows Vista and Windows 7, now portable to Windows XP. WindowBlinds 6 6.40 is a shareware program and can be used as a demo to try the software until the free trial period has ended. A full version of the program is available after the trial period ends. For security reasons, you should also check out the WindowBlinds 6 download at LO4D.com which includes virus and malware tests. Additional screenshots of this application download may be available, too. WindowBlinds 6 has a presence on social networks.